I’m a bit lame right now, so I’m using a cane, and it magically reminds me of one of my absolutely favorite chapters in IT’S ALL ABOUT AGING — the witty but wise one about Cane Fu! 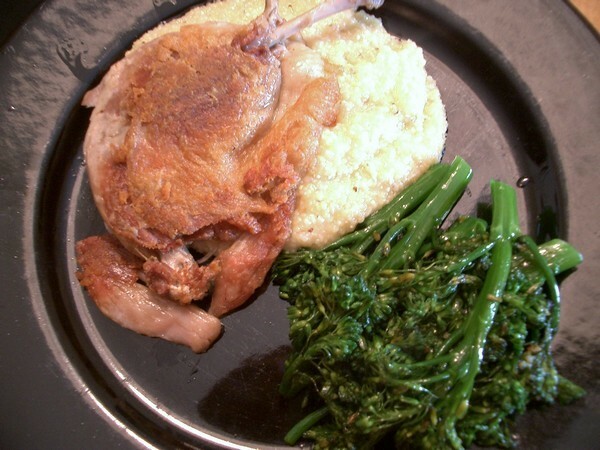 I love duck thighs, and can’t wait to learn sous-vide, but today’s innocently thrilling overall title — Since When do you have to be Hungry to Eat? — made me incredibly happy, just reading that question, and I hereby BEG you to write a whole essay answering it in 2012!!!!!?????!!!!!!!! Thanks! I did it in the slow cooker. This is inspiring… I want to sous-vide so bad now …. 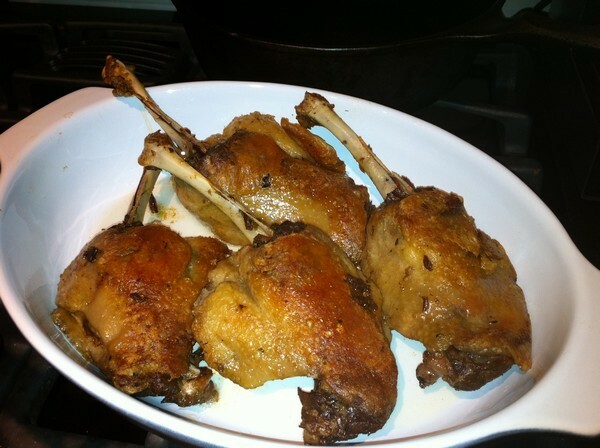 I had a ton of duck fat from a previous batch of confit done the conventional way that I’d ordered from D’Artagnan. The advantage of doing it sous-vide was that it only takes a couple of tablespoons of fat. To crisp it, I just sautéed it in a non-stick pan, skin side up to start just so some of the remaining fat would render. Then I flipped it and cooked it until the skin was browned and crisp (by which time I’d nibbled off most of the drumstick!). method did you use to crisp up the duck? Thanks so much. You’re doing well. Next post: Since When do You Have to be Hungry to Eat?